We're debuting a couple new greeting cards this year, in celebration of Valentine's Day! We love this playful card with a striking blue and gray eye. The message is simple and sweet. Nothing says I love you like a sweet, hand-written note and a really good box of chocolates. We've designed these red and gray cards with that thought in mind. The inspiration for this card, the Whitman's Sampler box, has been a Valentine's Day staple since 1912. We encourage sending handwritten love notes all year long, but if there's one day a year to write to your paramour, this is it. These and more Valentine's Day cards are available on our website now! We just finished a new design for our line of greeting cards. Our various floral layouts are always very popular so we worked on a version with a pretty arrangement and a really contemporary mix of dark, neutral ink and bright, fluorescent yellow. We love how this card straddles the vintage theme with 21st century colors! 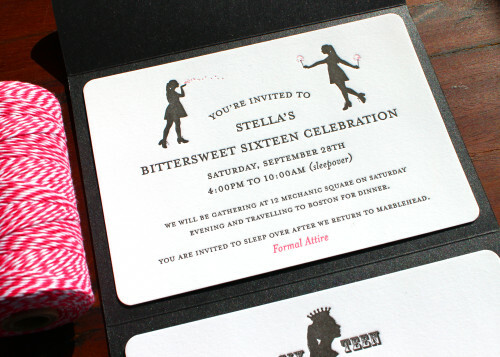 This might have been the first time we had the chance to design and print Sweet Sixteen invitations and it was FUN! We love all the different letterpress components to this set: the pink "16", the invitations themselves and that lovely sparkly black folder. The colors and design were chosen to be youthful but not childish. We're really pleased with how these came out! 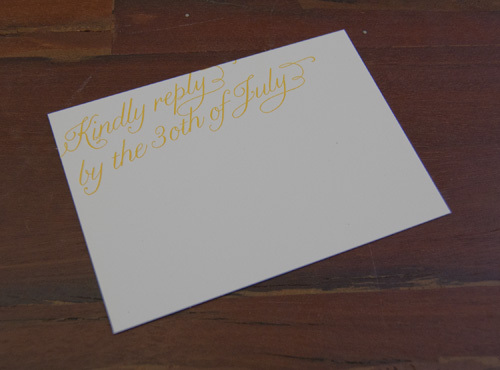 Now we're excited to get more birthday invitation printing opportunities! Show your dad how awesome you think he is with this card. It's almost like giving him a medal for services to fatherhood! We love the bright red and blue motif and the fun design. 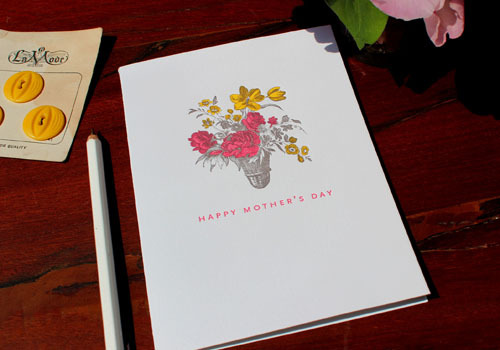 Just a few weeks to go until Mother's Day and we have designed a really lovely card for the occasion! We love this bouquet and we think it looks particularly pretty printed in bright sunshine yellow and pink. A little bit of celebrity! Sometimes we are asked to do some printing for clients who have quite a high profile. We never get too star-struck but at the same time, it's lovely to see our designs and printing featured online and in print. We recently bought ourselves a copy of Martha Stewart Weddings so we could take a look through their coverage of the wedding of Blake Lively and Ryan Reynolds. We printed the letterpress borders which surrounded their silhouettes on the opening page of the article. 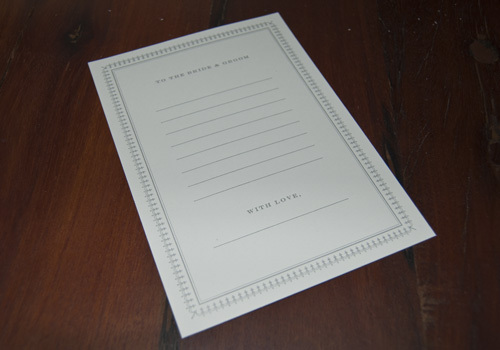 We also printed cards for guests to fill in with messages for the happy couple! We have printed business cards a few times for Nicolette Owen owner of Nicolette Camille. 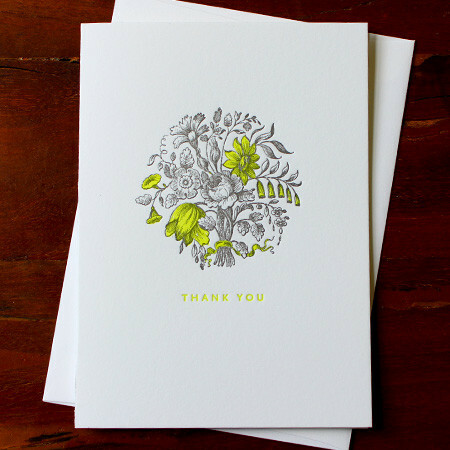 She is a floral designer and she designed this card to reflect the scope of her business. 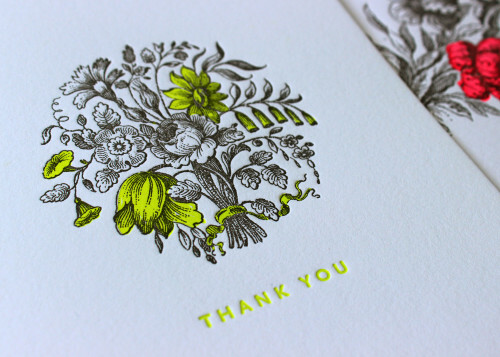 It looks so pretty in letterpress with all the fine detail picked out. Check out Nicolette's beautiful creations on her blog too. Card designed by Linda Aldredge, the creative force behind LuLu Organics. They then got in touch with us to print them some thank you notes and again they used the knot image, this time printed in blue. We love the sense of continuity that is established through using the same design components and ink colors across a whole suite of personal stationery. Well, admittedly we're not even past Christmas yet. But we're thinking ahead! And we do love a good New Year's Eve Party... I've been going through our stock and I think I have found the perfect card to use as an invitation or to say a festive thanks for gifts and fun events. I love the slightly old-fashioned image of a drinks tray, especially the way it has been modernized with flashes of bright yellow. Being British, I also like the greeting, "cheers", printed underneath! What do you think? If you want to purchase a few of these for your New Year's party, just click here! Here are a few more examples of some business cards we have really enjoyed designing and printing. There's something lovely and tactile about a letterpress business card - you can really feel the indentation of the type on the card. In Japan, the business card or "meishi" is quite an important item in terms of how it is exchanged and received. The card should be held at the bottom two corners, face up and angled so that it can be read by the person receiving it. The recipient takes it by the top two corners using both hands. Placing one's fingers over the name or other information is considered rude. 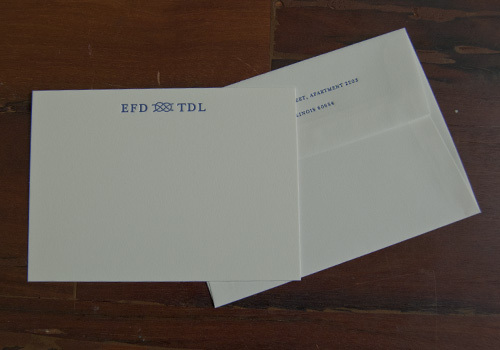 Upon receiving the card, one is expected to read the card carefully, noting the person's name and position. It's an acknowledgement of the status of the person giving the card - definitely a different experience to the more Western approach to distributing business cards! Most of the business cards we print are rectangular. 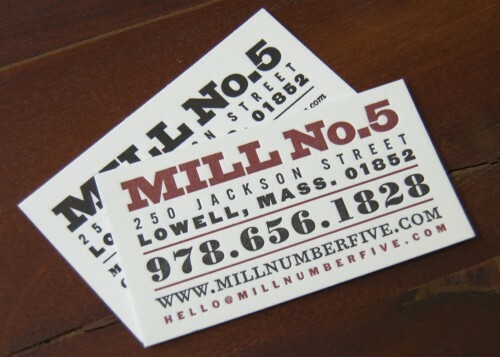 This follows on from the earliest examples of calling cards which would always be this shape. 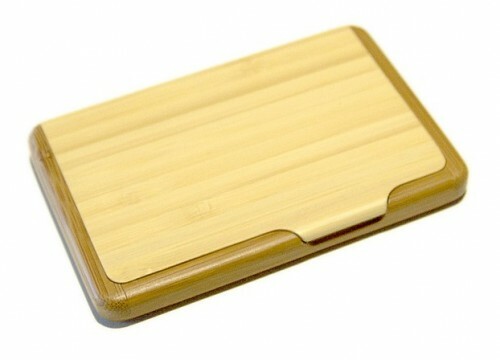 However, we also like the individuality implicit in a card with an unusual shape or dimensions. We recently printed this gorgeous square business card and now most of us here in the workshop are coveting them! If a gentleman folded over the left hand upper corner of his card, it implied that his visit was congratulatory in nature. A fold to the lower left hand corner meant that he sent his condolences. If a gentleman was taking leave for a considerable amount of time, this would be communicated by a fold in the lower right hand corner. Our friends over at Felt and Wire just did a really nice post on silhouettes in graphic design. I love Roberto de Vicq’s book covers for author Chris Cleave and it was an honor to be included in the same post.